As a quick summary of the rest of last night's game... the Cubs cruised to an 11-3 win... Zambrano hit the 17th home run of his career... Tom Gordon pitched a perfect Top of the 9th, retiring the Cubs on 9 pitches. 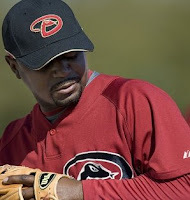 I didn't know he was on the Diamondbacks. Heck, I didn't know he was still in the league. I'm currently watching the Tigers and Yankees, with a wonderful pitching matchup. Our darling, Rick Porcello, is facing off against Joba Chamberlain. In another really good matchup, Johan Santana and the Mets hosted Josh Johnson and the Marlins. Johan outpitched Johnson a little and left with a 3 - 2 lead. Unfortunately, for the Mets, JJ Putz did his best Aaron Heilman impersonation by walking the first two batters, leading to a 4 - 3 Marlins win. The Diamondbacks exacted their revenge on the Cubs with a 10 - 0 shellacking. Doug Davis threw 7 innings of 2-hit ball, as Ryan Dempster, Carlos Marmol, and Kevin Gregg were charged with 10 earned runs. Coming back from a few days off due to injury, Carlos Marmol had an absolutely debilitating day for any fantasy owners who activated him. He pitched 1/3 of an inning, walked 4 guys, and they all scored. His season ERA is now 6.75. I really hope he's going to be okay because he's the only "good" reliever the Cubs have. This is starting to be a very big concern. Seriously, no-one in that bullpen has been any good. How can you win 90-something games with that bullpen? You probably can't. The Angels won at Baltimore. We were pleased to see Kendry Morales hit a big homerun for the halos. One of my most memorable experiences in Portland was when Kendry Morales came to town. 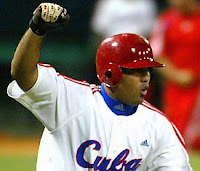 Being the son of a Cuban immigrant makes it so I always check out the Cuban ballplayers, Alexei, Yunel, Kendry, Dayan Viciedo, etc. Anyway, in this game between the Portland Beavers and the Salt Lake Bees, Morales hit a home run from both sides of the plate. The second one came from the right handed side and bounced back into left field. I - becoming a fan for a moment - yelled at Beavers' left fielder, Termell Sledge, to toss me the ball, which he did. Once I came to my senses, the ball ended up going to the child of one of our corporate sponsors, so at least there was a happy ending. Yovani Gallardo really won a pitching battle. Not only did he pitch eight sparkling innings, with 2 hits, 1 walk, and 11 strikeouts, but he also hit a solo home run in a game that ended with a 1 to 0 final score. Incredible. Huston Street got his second save of the season as the Rockies beat the Padres. We were pleased to see Todd Helton and Henry Blanco hit home runs.